Winning a large lottery jackpot can take you from broke to wealthy overnight. While this phenomenon is only experienced by beating extreme odds, buying a lottery ticket may very well be the cheapest piece of hope someone can buy. Ohio offers access to a couple of large lottery jackpots, including the Powerball, Classic Lotto and Megamillions lotteries. In addition, the Ohio Lottery offers instant win games and daily lotteries. How jackpot winners claim their winnings will depend on the dollar amount won. Verify you own the winning jackpot numbers. The winning lottery numbers are generally announced on local television stations, and are also available online at the lottery website and by telephone hot-line (the number is generally on the lotto ticket). Retailers selling lottery tickets can check the ticket for you, or may have automated lottery machines where you can scan your ticket to determine if it is a winner. Determine the amount of the lottery jackpot won. Each lottery has a different collection procedure depending on the jackpot amount. Claim your prize within 180 days of the drawing date. The last day to redeem your prize is the 180th day following the drawing date, after which you forfeit your prize. 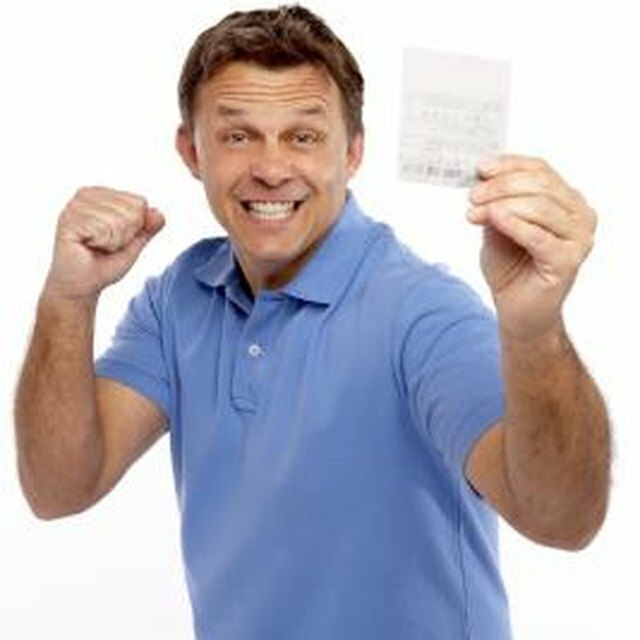 Claim a lottery prize up to $599 at any retailer selling lottery tickets. This amount can be redeemed by an on-the-spot payment of your prize. Claim a lottery prize in the amount of $600 to $5,000 by taking the winning ticket to a lottery retailer and receiving a "Pay to Bearer" ticket in return. The retailer will also provide you with a claim form that must be completed, or you can print one out in advance from the Ohio Lottery's website. Take the completed claim form and the "Pay to Bearer" ticket to a participating bank-cashing location to receive payment. The retailer can direct you to the nearest location. You will be required to show valid photo identification (driver's license or combination of photo ID and Social Security card). Most banks charge a $10 fee for paying out the prize. Claim a lottery prize for the amount of $600 to $5,000 by mailing the completed Lottery claim form. Ask the retailer for assistance with validating the ticket, as you will need to include a "Pay to Bearer" receipt from the retailer and the original lottery ticket with the completed claim form. Mail it to: Ohio Lottery Commission-Room 452, 615 W Superior Way, Cleveland, OH 44113-1879 (also found on form). Wait up to 30 days for payment by check. This option avoids the $10 fee charged by bank-cashing locations. You can also go directly to a regional Ohio Lottery office to validate the ticket and complete the claim form. Schedule an appointment for claiming your jackpot prize. Ohio Lottery-Megamillions: FAQ-How Do I Claim a Megamillions Prize? Ohio Lottery-Powerball: Questions and Answers-How Do I Claim My Prize?